There's all sorts of free music in Melbourne, year round. This Melbourne Music page will show you where to find some of the top places to visit. 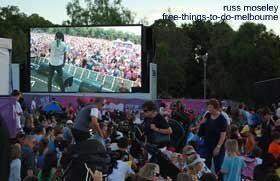 There's free music at festivals, Federation Square, Sidney Myer Music Bowl, markets, churches and parks. You'll find music ranging from indie, pop, classical, folk, swing, big band, jazz, rock, dance, african, aboriginal and probably other types I can't remember at the moment! .......We went to another three events they played last year too. Great rock and pop music and suitable for all ages.....even my then 3 year old was wiggling her hips in time to the beat. .......probably helped by the fact my daughter, then aged two, surprised us with her dancing skills, showing off to the crowd! 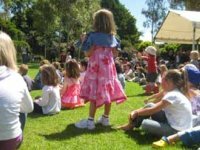 The Melbourne Music Summer Series in Fitzroy Gardens is another music event we really like....We stumbled across this last year but it's now a fixture in the diary. 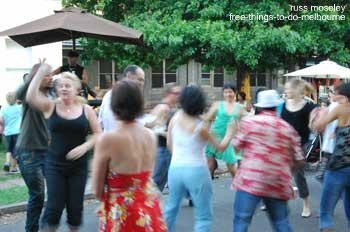 Recently in Abbotsford Suppermarket there was a really good salsa band that had people up boogieing. Click on the items below for more details on these and other venues and get out and enjoy yourself! Federation Square - big choice in different types of music. Outdoor and indoor performances. 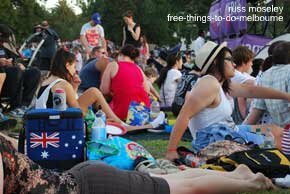 Sidney Myer Music Bowl - Free classical concerts by the Melbourne Symphony Orchestra. Stonnington Symphony Orchestra - an evening's entertainment every February. Melbourne Markets - Quiet background jazz or in-your-face loud rock music, you choose!